A couple of months ago, I had a bike ride on the Capital City Trail. The trail loops from Carlton North through to Flemington down to the Docklands, and along the Yarra back up north again. On the way down to Docklands, I spotted a sign for Costco. Costco, for those not in the know, is a huge bulk buy store for food, alcohol, clothes, electronics and everything in between. Why buy a half litre bottle of tomato sauce when you can buy a 5 litre bottle? When I travel to the US, I make a point to stop by a Costco to pick up pain killers (96 for a few dollars) and gum in bulk. According to the AAP, Costco Dockalnds will open in July and the company plans to open up a Sydney store at a later date. Any shakeup to the duopoly of supermarkets in Australia is great for competition and will hopefully mean lower prices for Melbourne. When I first heard that Costco was going to open in Docklands, I thought it was not going to work due to lack of parking and accessibility for cars. I stand corrected as it has positioned itself in an area with ample parking located on Docklands Highway just near the Citylink on ramp. Incidentily, it happens to also be on the Capital City Trail. 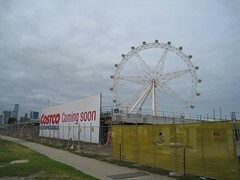 At least if they can get Costco open it will make up for the debacle that is the Southern Star Observation Wheel. .